Within the last few years there has been an increase in the number of programmes enabling one to show sequences of images or presentations on the computer. I hope here to keep you upto date with the pros and cons of the various programmes now available. First a bit of history ! Having spent a fair number of years dragging around the country 8 projectors, control devices, hi-fi etc. to do slide tape shows the idea of just using a laptop and video projector seemed a good idea. However it is only recently that projectors have become affordable and laptops have become powerful enough. One of the first, if not the very the first programme that looked promising was Image Q from Image North of Ontario, Canada. Best known for their work with a caption generator programme (Inscriber) for Targa boards and the video market, Image North's multimedia package Image Q first worked on DOS and Windows 3.11 systems in the early 90's, with later versions working on Windows 95 and NT4. Unfortunately Image North lost interest and they failed to update it for the latest operating systems. One of its blessings was the fact that one did not need a high spec machine to run it and the dissolves were adequate though not perfect. Timing was difficult to achieve due to the lack of a time line but it was easy to use and I still use in in certain circumstances for presentations. It does allow you to add AVI's and FLI's . Text addition is fairly basic. I had high hopes of Director, a Macromedia product that can be used on both PC and Apple Mac platforms but I found the fades between images were very poor so whilst it was very powerful in many ways it was limited as an option for slide-tape and far too expensive too. A programme that is popular for doing presentations in commercial circles is Powerpoint but again its dissolve transitions are very basic and to be honest pretty useless. So that is a nonstarter. However like all Kai products the front end is way over the top - like most of the effects with the programme. It is not easy to sync a sequence accurately to a sound track and to be fair it is really not designed for that. You can import text and sound. http://www.digitalworkshop.com This is a full multi-media product with many options but it is not a simple programme to use and its dissolve effects are not as good as some others. I found the fades were jerky at times. Another programme to miss is Medi@show from http://www.cyberlink.com.tw. The downloadable demo is useless for trial purposes. You are limited to ten images unfortunately. The front end has similarities to Kai Power Show with lots of wasted space. There is a basic time line with no indication of timing or syncing with the soundtrack. 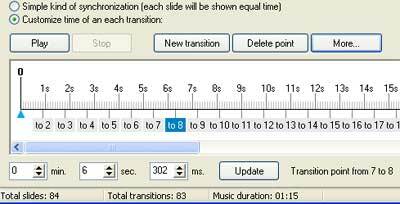 You can control the duration of a slide but only to the nearest second and the maximum length of a transition is 10 seconds. You cannot set the timing in tenths of a second. Some of the transitions are quite innovative but alas you would rarely use them in practice I’m afraid. The fade transition is quite smooth however and for very simple sequences without requiring accurate timing Medi@Show should be OK.
Advanced Slide Show from http://www.gold-software.com/slideshow.shtml is another one to miss.It comes in several parts, the demo lasting 60 days with constant reminders coming up on your desktop as to how long you've got left ! Alas this one does not fade at all and each slide changes to the background colour before moving to the next slide. You have little control over anything! I am afraid this is a really basic programme - a bit like showing slides on one Carousel projector. Xatshow from http://www.xatshow.com is slightly different. But the bottom line is that there is little or no control of the transitions and timing etc. so its not one that can be used for Digi-View. Lots of transitions but no control of the fades or proper sync. Above is an example of the graphic display from a sound programme of the same sound track as the one shown in ShowBiz. 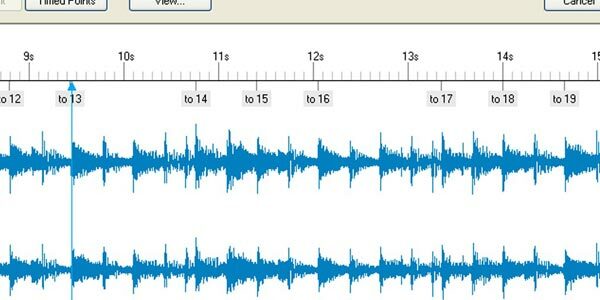 It would not be too hard to use the music programme to note the time in seconds of important points and then use this information to set change points in your main image sequencing programme. You can choose both size and types of compression. Remember full screen AVI's can be big files . A relatively new French programme is GlobFx and a downloadable demo can be obtained at http://www.globfx.com. This is a powerful and useful inexpensive programme but has a major drawback. It works on specific graphics cards rather than fast processors so unless you have the latest cards with upto date drivers with at least 32 megs of video memory forget it. As you can see below from the section of the front end of Globfx the real-time preview is quite large and you can run the preview from any point in the timeline. You can as many tracks as you like but the more you make visible the smaller the preview becomes so 4-6 tracks is enough for most purposes. The audio track does not have a visible indication of the sound ( as yet ). 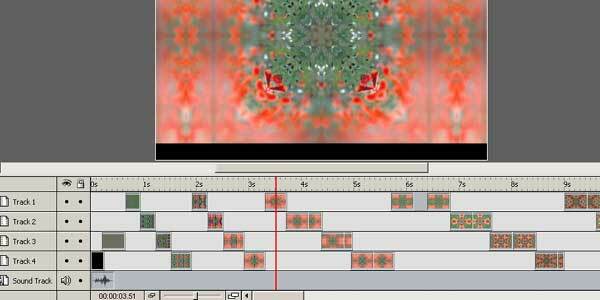 Unusually the only transitions are the cut and the fade - yes you read it correctly, no page turns, push - ons etc. etc. However you do get almost unlimited control over the opacity, timing and type of dissolve. Another very useful advantage is that you can apply special effects to individual images. Some of them are a bit over the top from our point of view but a gentle zoom in or pan of images could be an welcome addition to the armoury.Images can be positioned and resized to make up a type of multivision presentation. Text can be inserted and animated with the motion or special effects and for those into animation it also possible to insert a sequence of images ( ie from a 3D programme). If the time between images is cut right down the animation plays almost as real time. Because the programme is relying on the amount of video memory there is always going to be a limit to the number of images or effects so you will have to experiment. You can export in a number of ways - as a GlobFx movie - an .exe file which will play on a PC with a similar graphic card (important) or as a GlobFx Movie that will play back on GlobFx player ( .gbx) - similar graphic card required to run the Player. So distribution of the end result is a problem. It can also be exported as an AVI file specifying the size, frame rate and compression etc. It would appear that all work on this programme has come to a grinding halt which is a shame. Perhaps they have lost the software engineer who was working on it. I will be checking out the quality of DVD's made with this programme later. Last but by no means least is PTE (Picture-to Exe) an inexpensive Russian programme that appears to be the favourite at the moment. In comparison to the last two it is a simple programme but one that it improving all the time . You can download a demo from http://www.wnsoft.com. It first grew attention to itself by having such smooth dissolves and its ability to set transitions and the duration of images to fractions of a second. Its front end is different to the others. In early versions there was no time line and on the left was a list of the images - no thumbnails . The images are then added or dragged across to the image list. Here the image must be chosen then customized in a special menu which sets the duration time and type and time of transition for that image. In this menu you can also add individual sound bites or add a sound track at the start. When you have added a few images you then run the preview to see how the programme syncs. You can then adjust the timings accordingly. When you have completed the programme and don't forget at the moment you have to keep running the preview to get the sync right. This can be tedious if you have a long programme and you just want to tidy up the last few images! Hopefully a future release will enable us to run the preview from any point in the sequence. You can finally save the preview to an exe file which will play on any PC. The trouble is if you want accurate sync there must be some compatibility in processors between the machine the sequence is recorded on and the PC it is played back on. The designer is working hard on improving the syncing and a recent beta release incorporated a simple time line feature. It is fairly basic at the moment but one hopes for more. At the moment it can give very good results when played back on the same or similar computer and I have managed sync on twenty minute programmes containing many important sync points - see later. A few general points on putting together and showing a sequence. The original images will come from either existing slides , negatives , prints or nowadays images from a digital camera. The resolution of these varying sources will differ greatly in size and although it is possible to use say 2560 x 1920 jpeg images from a Dimage 7 digital camera in PTE the .exe size will rise rapidly and soon become impractical. You really have to balance size and quality and consider how your 'show' is to be seen. Medium compression jpegs of 1024 x 768 are a reasonable compromise. Forget using .wav files for the audio. They are far too large. Transfer them to mp3 - try dBpowerAMP Music Converter - http://www.dBpowerAMP.com. Many users will just be happy to play their sequences on their monitors or TV's and the output size of 1024 x 768 (XGA) will be fine. As far as video/data projectors are concerned as prices come down in the growing market the lower priced ones have a 800 x 600 output. However there are some budget 1024 x 768 ones becoming available. For a small group of people in subdued lighting conditions a brightness of about 1000 lumens should be OK. You also need a contrast ratio of at least 400:1. If at all possible it is best to try out your output with different projectors before buying. very wide screen 800 x 286 3:1 ratio. Within any of these formats you could either fill the screen or use smaller images using multi-image techniques. Once the format is decided then you have to gather together your images from varying resources. If you are going to fill the screen then it looks much better if all the images are all the same size. To achieve this you could use either Photoshop or Paint Shop Pro. Both have crop tools that can be set to the required size. 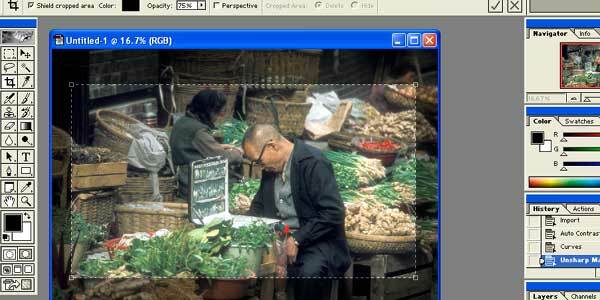 You then move the crop tool around the image to get the best composition. Below is the Photoshop display which darkens the area excluded from your choice. As you move the tiny squares at each corner so your choice will change but the resultant size of your crop will 1024 x 576 no matter what section of the original image ( 3496 x 2376), scanned in from the slide, was decided upon. In Photoshop 6 the crop size is set at the top of the screen. 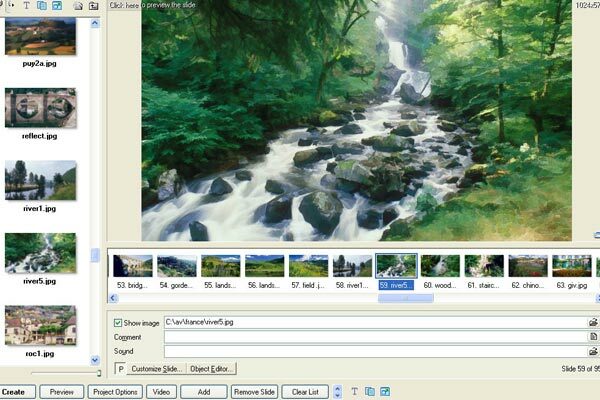 In Paint Shop pro you have to go into tool options and crop settings. Above shows the time line of PTE v 3.7 beta 3. After first adding the sound track in the music section of the project options you then click the play button and click the new transition button every time you want the the change to take place, having first set the type and duration of the transition in the custom menu. Any adjustments can be made by clicking on the 'more' button and altering the time in the boxes provided. As you can see you can add or delete transition points also. Remember adjusting one of the points will not automatically adjust any of the others. PTE is not perfect and there are a few things I would like to see that would help in programming complex sequences. 1. Floating menus would help. 3. Thumbnails in the timeline with the ability to zoom into 2 and 3 second segments when there is a lot going on would be helpful. 4. A waveform view of the sound track would be useful in editing transition points. Having decided on your piece of music or sound track then you have to put your newly resized images in order. In traditional slide - tape this is where the lightbox came in. The slides were placed on the lightbox and it was easy to edit them into the correct order to match the sound track or feel of the music by matching the colour or shapes in the images. However though there are lots of computer programmes that will show you thumbnail views of your images, moving them around by using the mouse is a different matter. I have discovered that the demo CD of the Wings software - http://www.stumpfl.com has a section called 'Picture Pool' in which you can move images around with your mouse. The thumbnails can be set at different sizes and you can add the file name if required - very useful. You reach it by opening a new project and under the picture menu you will find 'Picture Pool'. Right clicking on a space will enable you to load in images. Warning !! In doing this the programme makes BMP versions of the jpegs and 192 files ( smaller thumbnail files) These of course can be deleted later when you have sorted the images. A simpler solution for those running either Windows 2000 pro or XP is to set the directory with the images in Windows Explorer to 'thumbnails'. You can then move them around with the mouse. However in the Wings option you see more images to edit . The Wings software is designed with the Stumplf system of multi-slide projection. You design the sequence on the computer first and the instructions are passed via cable to the various slide projectors. However I have just heard that the latest software from this company - Wings Platinum is designed to work with video projectors as well as slide projectors with a serial port such as the latest Kodak or Leitz. There is little detail in English on their web site at the moment. Below is a grab from the German demo, downloadable from the German section of their web site. As you can see the graphic display of the sound is excellent and the dissolves can be tailored in a similar way to the sounds in Cool Edit.There will be several modules to the programme (including audio and video) when it is finally released. Work is in progress now on a sound track module so eventually you will be able to mix your sound track to match the images etc. It is going to be some months before the English version is available but I will keep you upto date with progress. As I understand it at the moment the export file will be an AVI with the latest Mpeg4 codecs to give maximum quality and good compression. English version is now out. It is going to cost about £100 per module. More news soon. The latest version of PTE - v4.0 beta2 enables you to see the transition effect in the picture area of the time line menu. This is a great improvement and you can now preview on the timeline from anywhere and see the duration of the transition as a bar between each image on the time line. You can now run the preview from any slide and zoom into th time line. Another new programme which has a very limited use is Imagematics Stillmotion Creator - it costs 99 dollars for a basic version and I think is far too much for what it will do. The downloadable demo will only save to a swf file (for the web).It does similar image movements as GlobFX by zooming, panning etc and you can fade between images . However there are limits, even with the full programme - 64 images and 9 minutes duration of programme. The product difference between the three modules are the output formats supported and I can only see it be used for 'animations' on the web. The preview panel does not show dissolves but does show zooms and movements etc. 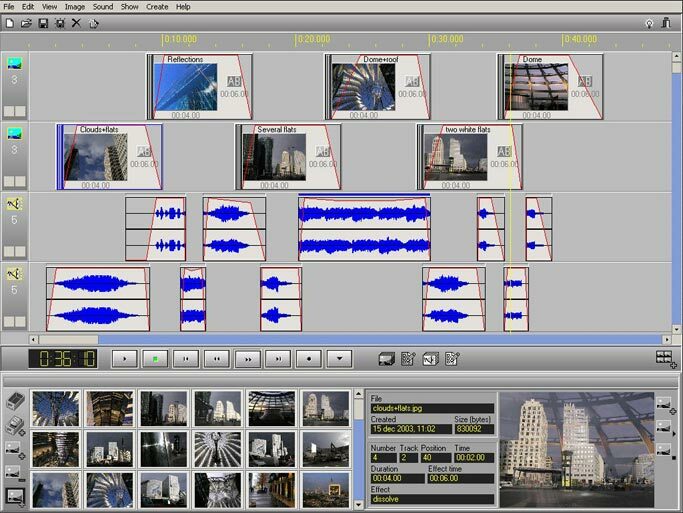 For those that use Cool Edit for producing sound tracks the latest version - Cool Edit Pro 2 has some excellent improvements, one of which is the ability to add a video track. This is helpful for GlobFx users that save as AVI files. You would be able to add any spot sound effects or commentary before putting back into GlobFx. Yet another new programme to have a look at is - Slide show to Go by nightwatch software. -www.nightwatchsoftware.com . It has a useful browser and a range of trasitions. The sync possibilities are very basic at the moment but it not expensive to register and there is a 30 day download verseion to try on the website already mentioned. This the latest view of the time line in PTE showing the transition duration. To show a small duration on a cut you will need to set a short duration for the slide on the main menu. Version 4 full version has just been released -March 11th - you can now zoom into the time line and run the full preview from any slide. The latest version of PTE ( v4.2 beta2 ) - Dec 2003 has the ability to save as an AVI file which can then be recorded onto a DVD with the right software. Initially I had several problems with the PTE codec not being recognised but now I have managed to burn three DVD's each with about an hours worth of sequences. The method I have used is as follows. I run PTE and load the first sequence. I then save the sequence as an AVI using the new button marked below. I then opened Ulead DVD Factory 2 and added the avi file just saved in PTE. Incidently it is important NOT to close PTE having saved the AVI. However having just added the AVI file to the Ulead programme I then close it and run Sonic MyDVD which came with my external Sony DVD recorder (RW DRU-500a) I then load the PTE AVI file into the Sonic software. This is then minimised. I then opened another version of PTE and the next sequence. I save this as an AVI file as before and then reopen the Ulead prog to load in the new PTE AVI file. I immediately close the Ulead prog and load this second PTE AVI file into the maximised Sonic programme. I again do not close down the PTE sequence. Having gone through this routine several times now it appears to work and gives me excellent versions of my sequences on DVD which play well on both the PC and TV. It could be because I am using more than one CD recorder on my PC (both internal and external) the PC is becoming confused - like me often! - and while the Ulead prog loaded all the AVI files in OK it fell over when asked to code them preparatory to burning the DVD. On the other hand when using the Sonic programme on its own sometimes it would load one or two AVI's Ok but then refuse to recognise the next one! Wierd! I am also looking at Mobjects, a programme that is similar to Wings Platinum. It comes from Germany and has several interesting features. Like Wings its background is in controlling old heavy projectors (remember those!) You can download a demo version from http://www.mobjects.com/software/hdr_actual/m_li2048.exe. As well as multiple image tracks you can pan , rotate and zoom images. I will be posting screen shots shortly. Since the above little problems I now imput the PTE AVI file into TMPGEnc Plus (http://www.pegsys-inc.com) and then use TMPGEnc DVD Author to do the DVD's. The quality is excellent. The latest version of PTE v 4.30 has a lightbox - hurrah! You can switch between the lightbox and the main view by pressing f3 and f4. There is an excellent way of resizing the images in the lightbox by moving a slider - brilliant. You can add to your list by using the add button or by double clicking the picture and the file name then becomes highlighted. There are two more innovations . On the time line in the customize Sync area you can now superimpose a graphic display of your audio track to help get exact sync and secondly the slide list menu can be moved to the bottom of the screen and you can now see the images if you wish. This will be really useful . The number of images will vary according to where you set the horizontal bar between the various menus. You can have from 4 to 18 depending on the height of the menu. On the left is the new look of the PTE front end showing thumbnails of the image list vertically on the left and thumbnails of the sequence pictures below the individual image. You can switch to the old way should you wish. This shows the new graphic audio display of PTE .You can now match exactly the slide change with each beat of the music if you wish. A new exiciting programme is due very shortly from Holland. Called D!G!Fects, it is similar to Wings and Mobjects rather than Showpro or PTE. It will have multiple audio and image tracks and each image will have extensive masking, panning and zooming effects in addition to saturation , lightening and darkening controls. 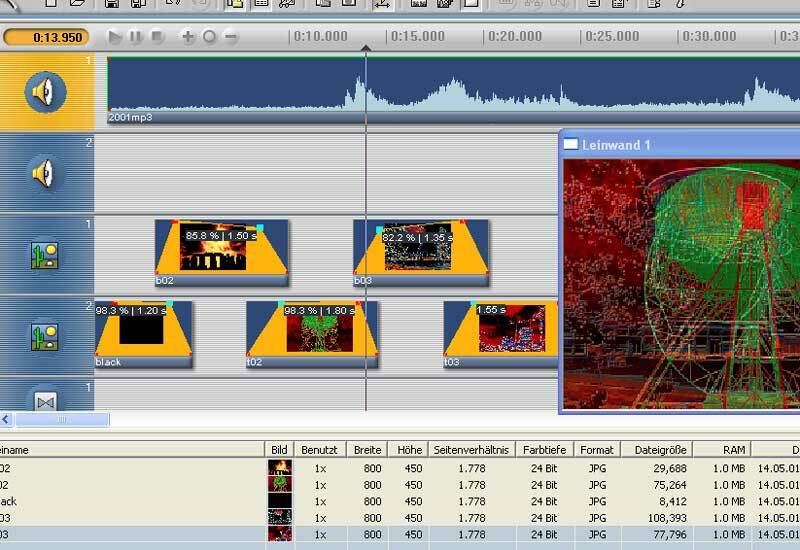 Full control is available for both audio and image transition curves. Below shows the front end of the programme. Due to illness the launch of D!g!Fects has had to be postponed. As soon as I get any more news I will post it here. Another multi-layer AV programme is ScreenAV. Similar in many ways to Wings, MObjects and D!g!fects it has several versions from a Lite 3 layer starter to a mult-video projector professional version. They all have something in common. All images are PRE-loaded. The full version of PTE ( 4.40 ) has some nice changes. On the time line you can now directly vary the image change rates by dragging the edge of the grey band with the mouse. You can also more easily move images around on the time line and there are some new transitions -curling page turns. The image zoom and pan feature is likely to come in the future - probably version 4.5. I hope to put together over the next few weeks more information on doing sequences on PTE - so watch this space. Sorry about the delays but I recently got a D70 and have been playing with the new toy!! see coverage here - http://www.rtfract.com/d70.htm. New version of Showpro 2 looks good at first glance. Includes possible pans and zooms of images. There is also another mystery programme in the pipline that does look interesting. More details when I can reveal more! A newish programme from Photodex.com is ProShow which can also save to DVD and gives reasonable quality. Version 2 promises to have zooms and pans! I await with interest.